Today I finally finished preparing one of the new hosta beds I meant to have done in June. I plan on finding some more miniature hostas and creating a "secret" garden in the space that is now void of any plants. This space was a woodpile until a couple weeks ago. So I moved the wood further back, edged it with stone, and the top dressed the bed with compost. 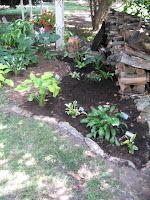 Now I am going to look for a fairy house and some more cute little mini hostas to put in this new bed.